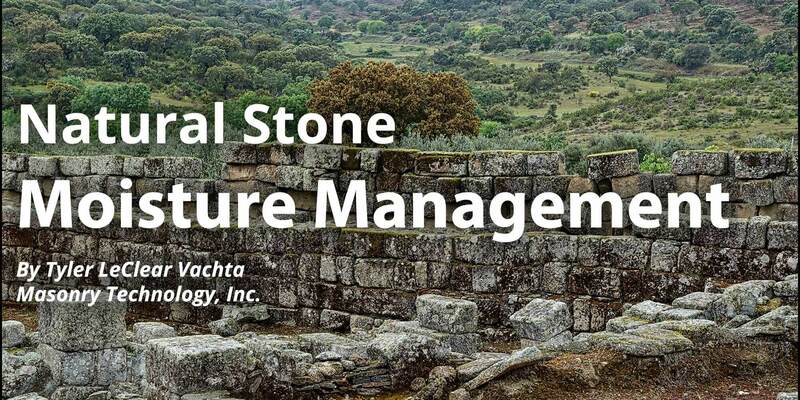 Full Stone Archives | Masonry Technology, Inc. Structures built of stone have stood the test of time, both structurally and aesthetically. Stone is strong, available just about anywhere, and has an undeniable visual appeal. The economics of recent centuries have shifted from building structures primarily with rocks to only using real stone on the facades of high dollar edifices, and a smaller number of experienced stone masons are keepers of the generational knowledge of building with stone. What’s Different About Building With Stone Today? Buildings constructed today with natural stone function differently from those of centuries past in many ways. Much like how unit masonry changed from mass construction to masonry veneers, stone based construction no longer relies on stone for structural strength. Anchored stone and adhered thin stone veneers have become the new normal, relying on a structural backup wall instead of the stone for strength. These changes along with significant changes to the backup wall assembly over the past 50 years have sometimes had unintended consequences. We’ve understood for a long time that reducing air leakage and improving thermal resistance of the building enclosure were beneficial to occupant comfort and energy consumption – but we haven’t fully appreciated the value of that air and energy flow on managing moisture in the building materials. The rush to air seal, insulate, reduce vapor drive and incorporate materials with reduced moisture capacity has led to an epidemic of moisture related wall failures that costs the industry billions of dollars each year. The wall failure epidemic has bounced around to EIFS, stucco, siding, brick, adhered stone, etc. anywhere it rains. We need to digest the lessons from these historic and ongoing problems. The recurring theme in these failures is that we need to help walls dry out, and get the detailing right. 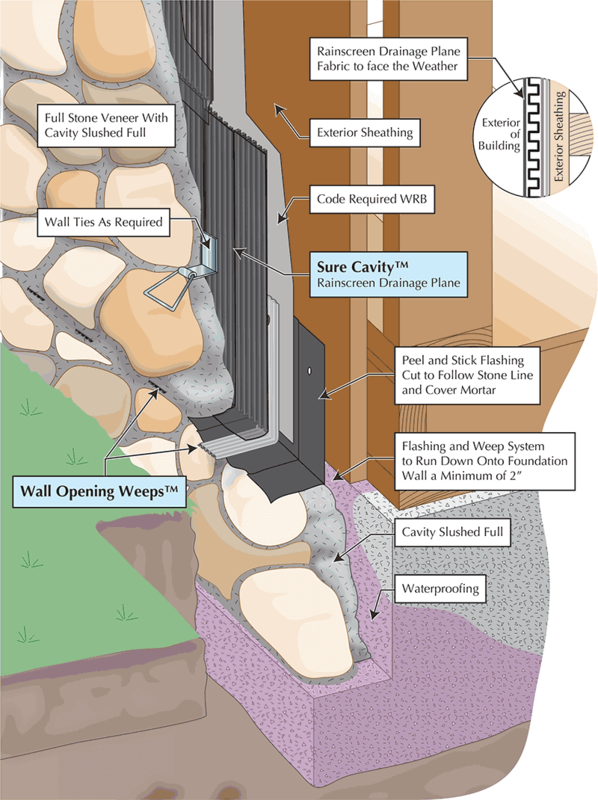 Full Stone Bottom of Wall Sure Cavity creates a consistent and predictable drainage & ventilation gap along the entire wall. 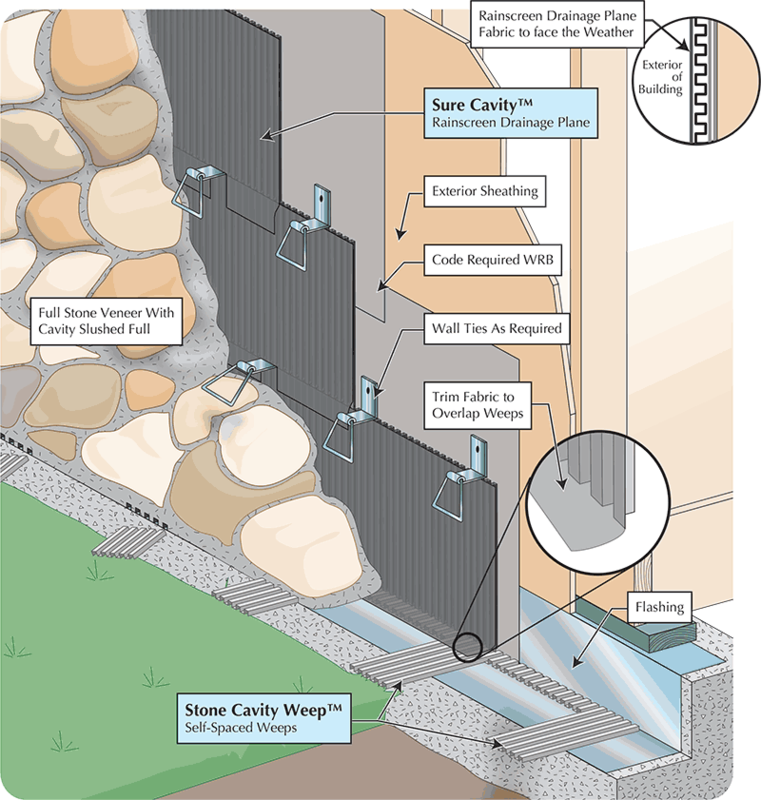 Self spaced Stone Cavity Weep creates frequent weep tunnels to drain moisture. Full Stone Window Windows & penetrations are high risk zones for moisture problems. Belt & suspenders approach: divert incidental moisture away from the window opening, provide weeps and a drip plate above the window. Most wall failures are caused by a small amount of water that can’t dry out. Anchored and adhered stone veneers are reservoir claddings – in other words, they have the ability to hold a lot of moisture. Masons have long known that using rainscreen design with a simple air gap behind a veneer is an effective water control that protects the backup wall. With adhered masonry systems and even anchored stone veneers the industry has traded the air gap (a physics based solution) for a WRB (water resistive barrier - a chemistry based solution). Take note: physics beats chemistry. Water resistive barriers are imperfect – they are perforated by fastener holes, subject to cracking, and can lose water repellency when exposed to surfactants in cementitious materials and wood. Without an air gap, capillary action allows water to move up the wall, against gravity. 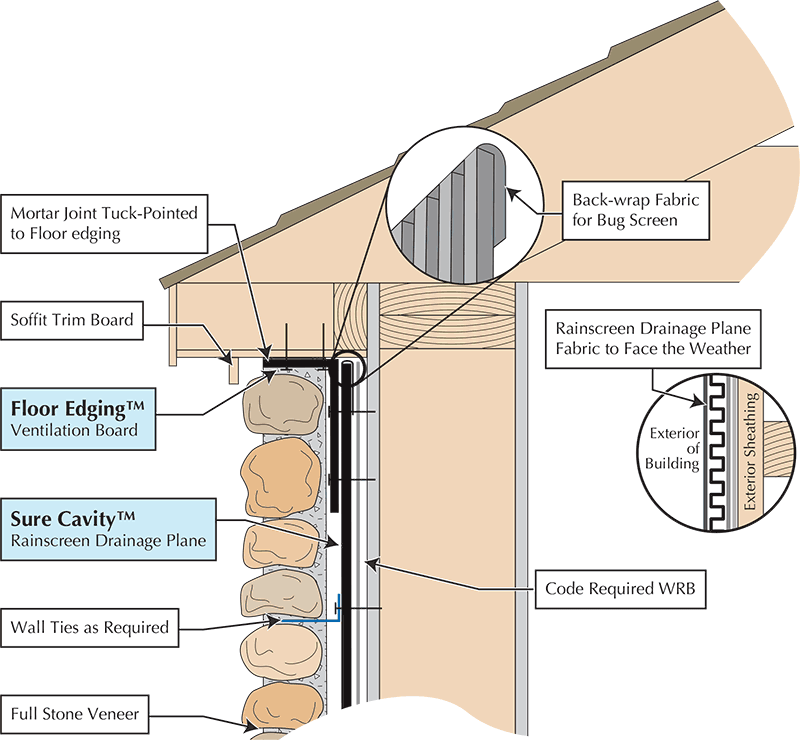 Without an air gap, water trapped between the veneer and the WRB will find its way to the weak points and wreak havoc. A predictable and continuous rainscreen drainage plane over the water resistive barrier, with weeps at the base, drains liquid water. Ventilating that air gap creates a small amount of airflow that allows the wall to dry out. As long as the air gap is at least 1/8” (to ensure a capillary break) gravity drains the wall to keep it dry. And by the way, gravity (physics) isn’t compromised by fastener holes, cracking, or loss of repellency. Gravity works all the time. High quality manufactured rainscreen drainage planes can be used to create and maintain a rainscreen air gap behind any veneer, including anchored and adhered stone. The classic rainscreen approach was to maintain a clear 1” air space behind the veneer. The problem is the “clear” part. In stone and unit masonry mortar squeezings clog the cavity and block weeps. Including a one-inch minimum thickness of cement grout between the backing and the stone veneer complicates the situation further as subsequent courses are laid. Using mesh to suspend mortar above the weeps just moves the mortar dam up the wall 10”, stifling airflow and obstructing drainage. The solution that ensures the air gap is continuous is a manufactured rainscreen drainage plane from the top of the wall to the weeps. Building Consultant Mark Parlee cautions that “A wonderful drainage mat turns out to be a complete waste of money if you leave out weeps at the base of the wall.” The details matter. Anyone looking at a wall section should be able to do the pen test for drainage to verify the moisture management plan. Starting at the top of the wall assembly, use a pen to trace the rainscreen drainage gap down to the bottom of the wall. Any time the pen is lifted, or travels outside of the assembly (like at a window) the system needs to either weep out of the wall or deflect moisture away from the discontinuity. The realm of stone masonry presents an opportunity to improve your resume and develop a reputation for high-level craftsmanship. Protect your reputation and reduce your risk by ensuring that moisture management is a priority on each project you take. Full Stone Vented At Soffit Ventilation increases the drying power of the wall system with air flow. Ventilated wall systems have vents at the top and bottom of the wall. Full Stone Veneer Run To Grade The premium appearance with run to grade stone takes good detailing. 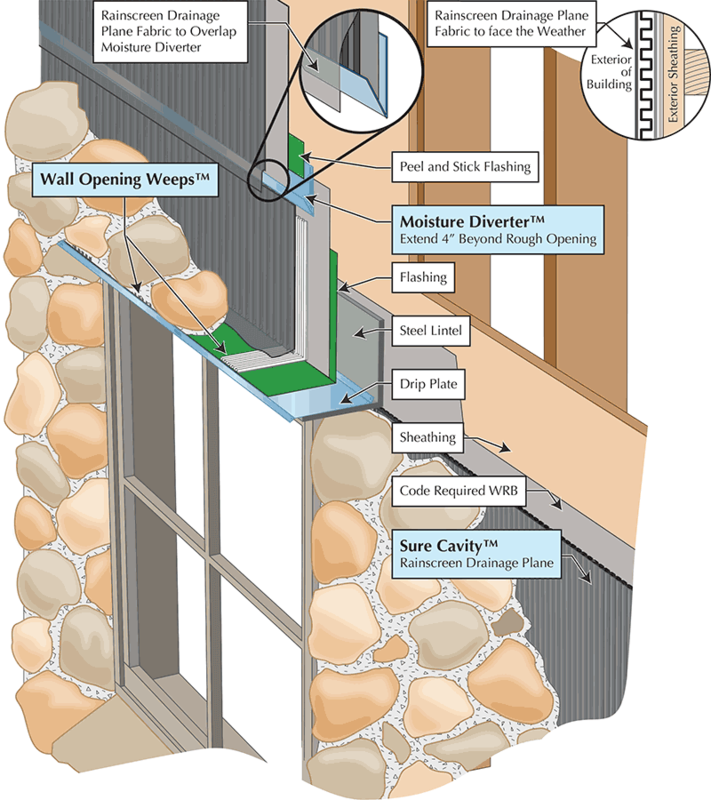 Follow the stone line with flashing and create weep tunnels on top of flashing. Ensure weeps drain above grade.